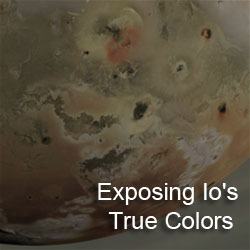 This week we are looking back at the discovery of Io and the other Galilean satellites by Galileo Galilei 400 years ago this Thursday. In part one of our series of posts in commemoration of this significant event in the history of astronomy and science, we look back at the invention of the telescope in the first decade of the 17th Century and how Galileo came to develop his own version and improve upon it. 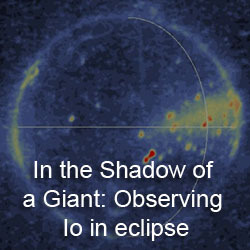 We will also take a brief look at the state of astronomy prior to Galileo's discovery. About ten months ago a report reached my ears that a Dutchman had constructed a telescope, by the aid of which visible objects, although at a great distance form the eye of the observer, where seen as if near; and some proofs of its most wonderful performances were reported, which some gave credence to, but other contradicted. 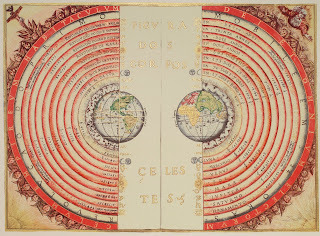 Since the time of Aristotle and Claudius Ptolemaeus, the western view of the structure of the universe was geocentric, with the Moon, the Sun, and the other planets revolving around a stationary Earth with fixed stars in the background (or Firmamento). Comets were viewed as atmospheric phenomenon, seen as portents of change. This system was the dominant theory in Europe with the backing of church theology that preached a Earth-centric universe with hell below and a perfect, unchanging heaven above. This world view was revived in the west in large part to the works of Saint Thomas Aquinas, summarized in his book, Summa Theologica. In the geocentric model, the planets were free of imperfections, all orbiting the Earth in circular orbits. However, these circular orbits did not explain the motion of the planets during opposition nor their changing brightness. So an increasing complex system of epicycles and epicycles upon epicycles were developed in an attempt to better explain planetary motion while keeping the Earth at the center of the universe. 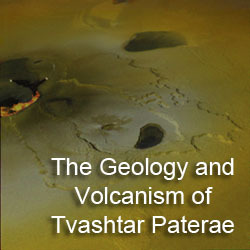 The late 16th and early 17th Centuries were important time periods in the history of astronomy and science. In 1543, Nicolaus Copernicus published his seminal work, De revolutionibus orbium coelestium, where he proposed a heliocentric universe, where the Earth moved around the Sun like the other planets in circular orbits. However, to account for the apparent non-uniform motion of the planets (now known to be a result of the planets moving in elliptical orbits), Copernicus retained the epicycles of the Ptolemaic geocentric model. Additional models were developed during the 16th century, such as Thomas Digges's A Perfit Description of the Caelestiall Orbes (suggesting an "infinite" number of stars) and Tycho Brahe's modified geocentric model. Brahe, while finding evidence such as supernovae and comets that revealed a changing sky, failed to detect stellar parallax, leading him to develop an alternative model, consisting of a geocentric universe with the Sun, stars, and Moon revolving around the Earth, but the other planets revolving around the Sun. By the start of the 17th Century, there was significant controversy regarding the validity of the Copernican model, which contradicted both Catholic and Protestant theologies at the time. 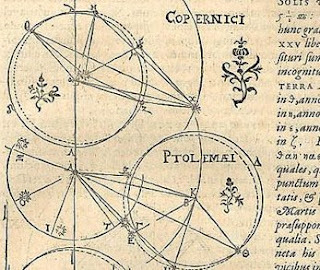 For astronomers of the age, such as Brahe's former assistant Johannes Kepler and Florentine mathematician Galileo Galilei, it was important to find further evidence that would confirm or refute the various theories that were discussed: the Ptolemaic geocentric model, the Copernican heliocentric model, or the Tychonic hybrid model. Kepler, then the imperial court mathematician under Emperor Rudolf II, developed a model to explain the non-uniform motion of Mars in his 1609 work, Astronomia Nova. He proposed that the planets moved in elliptical orbits, rather the perfect circles of earlier models, and that planets moved faster when they were closer to the Sun (perihelion) than when they are farther away (apohelion). This model provided a more accurate and elegant model to explain planetary motions than previous models that replied on complex systems of epicycles. On October 2, 1608, Dutch authorities at The Hague received a patent from Middleburg lens-maker Hans Lippershey for an instrument, "for seeing things far away as if they were nearby." This device used a pair of glass lenses, a convex object lens and a concave one for use as an eyepiece. This rudimentary telescope allowed for 3x magnification of distant objects. The patent was ultimately rejected as a result of similar designs by other Dutch lens makers like Sacharias Jansen and Jacob Metius. However, Lippershey was given a grant by his government to produce three more of the telescopes. News of the invention would spread from visitors to the Dutch court, like a Siamese emissary who was shown the scope while they were at The Hague. In 1609, word of the new invention reached astronomers like Thomas Harriot in England. Galileo Galilei first heard about the telescope while in Venice in late July 1609. There Venetian chief theologian Paolo Sarpi showed Galileo a letter from Jacques Badovere describing a copy of the instrument in Paris. In early August 1609, Galileo received word of a a copy of the device with a foreign merchant in Padua, where Galileo worked as a mathematics professor, prompting him to rush home. Unfortunately, by the time he arrived in Padua on August 3, the merchant had traveled on to Venice to sell his instrument. Galileo worked out from Badovere and Sarpi's description of the telescope from the news he had received from the Netherlands the arrangement and shape of lens that would be required to magnify the appearance of distant objects. His first design matched the magnification of Lippershey's instrument. Galileo at the time was suffering from some financial hardships and had hoped to get a salary increase for his work at the University of Padua on behalf of the Venetian government. He placed some hope if he managed to improve on the design of the telescope, he could receive a raise. By mid-August, Galileo developed a telescope design with an 8x magnification. 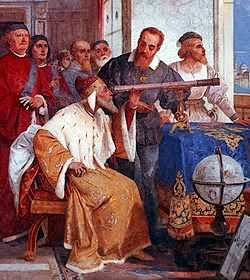 With his friend Sarpi holding off on purchasing the foreign merchant's telescope after being put in charge by the Venetian government to purchase it, he set up a demonstration of his improved telescope for Doge Leonardo Donato and members of the Venetian Segnoria and Senate from atop the campanile in the Piazza San Marco on August 25, 1609. He was able to show the telescopes ability to show ships 50 miles away as clearly as if they were 5 miles away, demonstrating the telescope's use as a naval instrument, very important for a naval power like the Venetian Republic. Giving the telescope as a gift to the Venetian state, his appointment to the University of Padua was renewed and his salary would be permanently doubled from 520 to 1000 florins per year after the end of his current term. While the pay raise initially sounded like a great solution to his financial woes, the fact that this salary would run for life with no prospect of future increases, Galileo would later look for employment elsewhere, such as the University of Pisa (which we will touch on more on Friday in Part 5). Tomorrow, January 5, we will continue this series by looking at Galileo's first scientific observations with his telescope in late 1609. We will also look at Thomas Harriot's work with the telescope that year.